I’m from Richmond, KY. I’m a graduate from Lindsey Wilson College in Columbia, KY where I received my Bachelors of Arts in Christian Ministry. I enjoy playing fetch with my dog, reading and spending time with my family. I have been a member of Athens Christian Church for twenty years. Athens was the first place I felt “at home” after my family moved to Lexington from eastern Kentucky. Athens is where I met my husband, Shawn, who has been a member for thirty years and currently serves as a deacon and on the worship team. 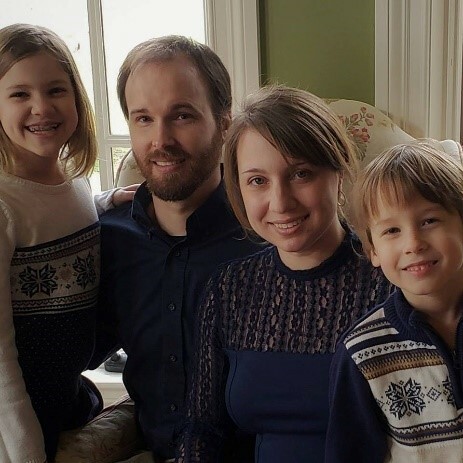 We have two children, Lily and Charlie, who are both actively involved in the Children’s Ministry Programs. I am proud to serve, worship, and raise my family here. At Athens, we strive to have blended services; combining beloved hymns with contemporary worship songs. For a small church, we do mighty works in our community and around the world through our various mission support. Everyone is welcome here to worship the living God, join in loving fellowship, and be a disciple of our Lord, Jesus Christ. Come join us for a Sunday morning or Wednesday evening service. I started ministering at Athens Christian Church in August of 2017. My first full-time ministry was in Cumberland, KY (Harlan County) in 1994. I met my wife while serving there and we were married in 1997. Today we have two wonderful boys: Lee and Jonah. We have lived in many places: Kentucky, North Carolina, West Virginia, Ohio and Wisconsin, but we consider Kentucky our home and are glad to be serving here in the Bluegrass State. My dad volunteered for the Viet Nam war and stayed in the Army, so I grew up as an “Army Brat”; I was born on a U.S. Army base in Germany and grew up over there. My wife was born and raised in Harlan County, KY. Both of my boys were born in Frankfort, KY. I went to Georgia Tech for my undergrad degree (Go Yellow Jackets!) and to Emmanuel Christian Seminary for my biblical education, but I’m proud to join my wife in cheering for the Wildcats. I love preaching the Gospel and ministering to people and can talk to anybody about nearly anything, thus Athens is a perfect place for me to minister. Athens is a smaller, family-oriented church and we are glad for that; there is good in all sizes of churches, but for those who like a church where everyone knows your name, the worship is simple, the preaching is bible-centered, and there is a strong sense of community we are a refreshing find. We are a congregation where you are not just a number searching for a parking place, you are a part of the family. I would love to meet you, so come drop by on a Sunday or a Wednesday. If there is anything I can do for you or if you have a prayer request, don’t hesitate to contact us.